In a long and often rambling discussion following a contentious interview on Monday with Senator Ted Cruz, radio host Glenn Beck criticized the Texas Senator’s justifications for finally endorsing Republican nominee Donald Trump. The radio talker even declared at one point that he should have backed Senator Marco Rubio for president, instead of throwing his full support to Cruz in the GOP primary. Beck grilled Cruz over his decision to back Trump after declining to do so on principle when he suspended his campaign and when he addressed the RNC convention in Cleveland. “This weekend, you wouldn’t answer the question if Donald Trump is fit to be president of the United States,” Beck said to Cruz. “You are encouraged by me to do what you believe is right and honorable and principled. And from my perspective, as I look at the issues, Hillary Clinton is telling us she will do enormous damage to the country,” Cruz replied. The Senator then explained again in detail the differences he sees between Trump and Democratic nominee Hillary Clinton. “You had this information the day you dropped out of the race and said that Donald Trump is a sociopathic liar,” Beck shot back. Cruz responded by again stating his belief that the general election involves “a binary choice” between Clinton and Trump, and every constitutional conservative agrees that Clinton would be a disastrous choice, especially in regards to appointing Supreme Court justices – an issue of special importance to Cruz, who was a former solicitor general. In explaining the timing of his Trump endorsement, Cruz noted that it came on the heels of Trump releasing an expanded list of conservative justices and promising that “the only nominees he would consider for the court were on that list.” He also noted Trump’s recent support for Cruz’s efforts to prevent President Obama from handing over Internet domain control from American supervision to an international body. Beck ended the interview by demanding to know if Cruz had sold his campaign’s email list to Trump, as was recently reported by Politico. BECK: I just have — I have one more question, and this is worth $20,000 to me. Bump the next commercial, please. Take that first commercial. Give me the extra minute for his response because I’m up against a network break. All of us have received pro-Trump emails, and we’re now on the Trump bandwagon. I have taken advertising from Donald Trump. And I would take advertising from Hillary Clinton because this is a business and I don’t believe keeping options gone. However, I think everybody should be able to have their voice heard on the public airwaves. However, me getting information or email list now on Donald Trump is really rather annoying. The only person that I ever gave my information to was you. As a candidate, you do not have to sell your list. Did you sell your list to Donald Trump? 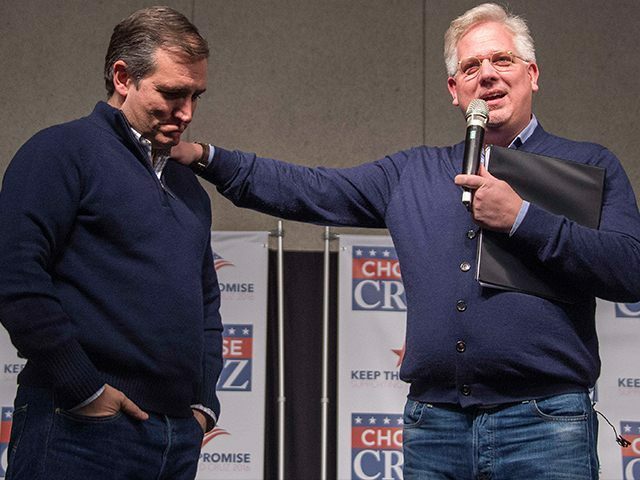 CRUZ: Well, Glenn, as you noted on your radio show, you sell advertising. It’s actually what funds your radio show. And that’s true of, as far as any radio show, that’s how one communicates. That’s also true of every candidate. You don’t sell your list, but you rent your list. So if someone wants to access your supporters, they pay for it. And that helps fund your efforts. And so like every other candidate, sure, we have rented our list out for those who wish to pay for it. That is true, by the way, of every other candidate. CRUZ: —but somehow is not applying that standard to anyone else in the political world or for that matter anyone else on radio who sells advertising every day to fund communicating with the voters. BECK: Well, I do have that same standard. Thank you very much. Ted, I disagree with you. I disagree with you strongly, but I still respect you as a man. And you have done a lot of great. And I hope you continue to do a lot of great work in the future. Thank you for coming on the program. CRUZ: I have to break. Thank you. I’m sorry, I have to break for this network. Here we go. After returning from break, Beck and his co-hosts expressed their disappointment in Cruz’s answers. I should have said, “You know who can win? You know who could beat Hillary Clinton? Marco Rubio. And I disagree with him on the Gang of Eight, and there’s about 80 percent that I do agree with him on. And he’s kind of a politician, but he’s a different kind of politician: He’s a young politician. He’s a Hispanic. He can win. Let’s go for it!” Instead, I said, “Let’s find a truly honorable man.” And that will always let you down. It will always let you down. Beck said that it would have been better if Cruz had said that he only endorsed Trump to appease his donors and supporters. “So he could have come on and said, ‘Look, guys, here’s the thing: My supporters are yelling at me.’ And I know that, because so are mine,” Beck said. “My donors, who were all in with the G.O.P., they’re all saying, ‘I’ll never fund you — I won’t fund you for the Senate. I won’t fund you for the run in 2020.’ And I have to make a decision. So the question is: Do I completely shut myself out of this game, or do I play the game as much as I possibly can? Look, there’s nobody that has held out longer than me,” he should have said. Look, I want you to listen very carefully to me because this is going to sound pretty outrageous: I am not here to fight for the — for the saving of America. I am not here to fight for the saving of this land. I am not here to save the — the — the — the — the system that we have built. I am here and you are here — we all are here for this time to save the idea of America. America is no more than that: an idea, that all men are created equal and endowed by their Creator with certain inalienable rights. And among them life, liberty, and the pursuit of happiness. That you have charge over your own life and you only answer to God, and God gives you those rights, and you give some of those rights to the government for protection. And the minute that that government begins to infringe on any of those rights, it is not just your — not just your willingness, it is your duty to overthrow anyone who would take those rights away. Those rights are what have us say, “I can do this. I can build a better mousetrap. I could be president. I could build a rocket and go to Mars. I can be left alone. I can participate. I can not participate.” It’s an idea that had never, ever happened before. And right now, what we are arguing about is the — is the destruction of our banking system. The destruction of our two-party system. The destruction of our capital. The destruction of law and order, whatever the hell that even means anymore. The destruction of our culture. The destruction of our churches, whatever the hell that means anymore. I don’t care if my children are more rich or less rich than me. I don’t care. I don’t care. What I do care is that my children are free to be able to chart their own course, free to be able to work or not work and starve. My children have a right to worship in the way they see fit and to move as their conscience tells them to move. Right now, we have become PETA. Shame on all of us. Why not — just if you won’t vote for Hillary our you won’t vote for Trump, why not just cover me in a bucket of blood? Why not just shame me in the public square? Why not run them out of business? They’re climate deniers! There is no difference between the two teams anymore. Oh, sure, one’s for a little lower taxes. One is the for border, one is not. One is for international rule, one is for national rule. Which one is for the idea that all men are created equal, that all men have a right to pursue their own happiness and make their own goddamn decision? Which one? Which one? I contend neither of them. And so we will just soak each other in buckets of blood. We’ll be a happy little bumper sticker community that shames one another into making sure you walk in goose-step with all the other Hillary supporters or walk in goose-step with all the other Trump supporters. Because she’s going to mean the destruction of America. No, no, says the Hillary supporter, you must vote for us because he means the destruction of America. I contend they both mean the destruction of the idea. Listen to Beck’s full interview with Cruz and the post-interview discussion above.